Red wine vinegar is made from red wine that has been allowed to ferment. Several types of vinegar and other acidic ingredients like lime juice can be used as substitutes. Different forms of vinegar can be used for food preparation, medicinal, agricultural or cleaning purposes. Vinegar is a fermented form of ethanol containing acetic acid which gives it a distinct bitter taste. Some types of vinegar also contain tartaric or citric acid which adds different flavor profiles to the condiment. Red wine vinegar is made by allowing red wine to ferment until acetic acid is produced. This is typically done by placing the wine in wooden barrels for up to two years. It is then purified, strained and bottled for sale. The quality of the wine used to create the vinegar will greatly affect the quality of the vinegar produced from the fermentation process, leading to a distinct difference in pricing. Inexpensive red wine vinegar will have an aggressive flavor profile, while more expensive vinegars will have more subtle fruity notes. If you require red wine vinegar for a recipe but do not have a bottle on hand, there are several options you can use in its place. These ingredients mimic the bitter, fruity flavor profile of red wine vinegar while still providing an acid content that will maintain the chemical composition necessary for your recipe. 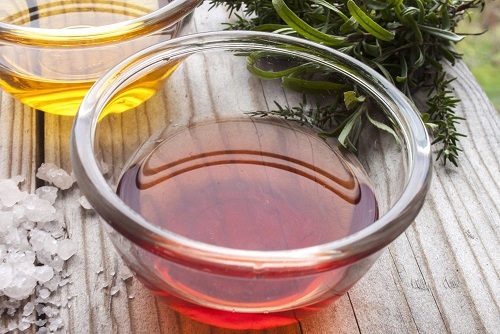 Several vinegars provide a similar flavor profile to red wine vinegar. White wine vinegar- Like red wine vinegar, white wine vinegar is made from wine that has been fermented. The acid level is similar, so it will not disturb the cooking process when used in stews, marinades, and sauces of vinaigrettes. In many recipes, French cooks prefer white wine vinegar to red. Balsamic vinegar- Balsamic vinegar is a frequent substitute used in Italian recipes. This vinegar is much more sweet and mild as compared to red wine vinegar. In order to counterbalance this, decrease the levels of any sweeteners your recipe calls for to allow the flavor of the vinegar to shine through. Rice wine vinegar- Rice wine vinegar will provide the bitter acidic taste associated with red wine vinegar, but the flavor here is much mellower than red wine vinegar. To balance this, you may need to increase the amount of vinegar you add as compared to the instructions in your recipe. Adjust your recipe to taste rather than counting on a specific measurement ratio. Sherry vinegar- Sherry vinegar is a preferred cooking agent for Spanish recipes. Like balsamic vinegar, sherry vinegar is much more sweet and mild compared to red wine vinegar, so you will need to reduce the levels of any sweeteners that your recipe calls for to get a proper balance of flavors. Apple cider vinegar- Apple cider vinegar provides the fruity flavor that is often associated with red wine vinegar. This vinegar is often more pungent than red wine vinegar, so substitute 3 tablespoons of apple cider vinegar for every 4 tablespoons of red wine vinegar in your recipe. Some ingredients can be used to mimic the flavor profile of red wine vinegar. These ingredients can be used as a flavoring profile, but may not provide the right level of acidity to replace red wine vinegar in a marinade, sauce or salad dressing. Red wine- A dry red wine can provide much of the acid content and flavoring necessary to complete a recipe, but may not be acidic enough to create an emulsion for dressings. Adding a bit of white vinegar or mustard can help completely prevent your dressing from breaking if it will not emulsify properly. Lemon/lime juice- Lemon and lime juice can provide a high level of acidity that is perfect for maintaining the acid level in recipes, though the flavor profile may not match the original ingredient. Tamarind paste- Tamarind paste has denaturing properties that are ideal for breaking down proteins. This is frequently used in Indian or Asian cuisine. Use this flavor sparingly to avoid altering the original recipe. Red and white wine vinegar mixture- If you are low on red wine vinegar you can finish the recipe with white wine vinegar or other types of vinegar to preserve the level of acidity you need. Add additional vinegars to taste, to ensure that you do not minimize the taste of the red wine vinegar in your recipe.